The latest addition to the Riva Line, this 28.55 metre yacht was recently presented at an exclusive event in Miami ahead of the show. 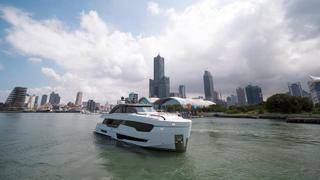 Developed by the Ferretti Engineering Department, in collaboration with the Officina Italiana Design Studio, the Riva 90 flybridge features a sundeck, concealed stairway system and a tender garage large enough to accommodate and launch a Williams 395 tender and a Jet Ski. With an interior layout featuring a maximum of five cabins, the Argo can reach a top speed of 30 knots, with a cruising speed of between 22 and 26 knots. 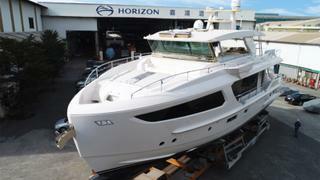 The first model in this fast displacement series from Horizon Yachts was recently shipped to the US in preparation for her world debut at the Palm Beach International Boat Show. Designed by veteran Horizon designer Cor D. Rover, the first 24.54 metre model was specifically built for the American market. The four-stateroom layout interior features an “elegant and modern” décor, with wooden flooring, white oak wall panelling and “sumptuous furnishings”. 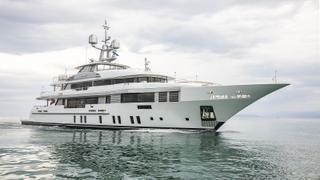 This recently delivered 49 metre yacht built by Benetti features a steel hull and aluminium superstructure painted in “pearly white with silver accents”, which create an “iridescent effect.” Exterior design comes from Argentinian designer Horacio Bozzo while interior design was handled in-house by Benetti. Materials include fine marble and wood while brands including Poltrona Frau, Giorgetti, Softhouse and Arketipo populate the interior. Elaldrea+ also features dual swimming pools; a seawater swimming pool sits on the upper deck while a second panoramic fresh water swimming pool sits on the sun deck. 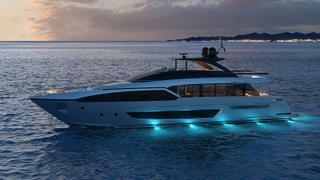 The second model in Baglietto’s T-Line 48 series, Silver Fox is the sister ship to Andiamo. The 47.6 metre displacement yacht features exterior styling by Italian designer Francesco Paszkowski and interior décor handled in-house. A key feature is the side-loading superyacht tender garage, which leaves the transom free to be exclusively used as a spacious beach club complete with a bar, gym and steam shower. Meanwhile the sundeck spans 140 metres of deck space, with an al fresco dining table, sunloungers and an infinity pool. First revealed in January at the boot Düsseldorf show, the 25.55 metre Pershing 8X has been described as a “true evolution” of the Pershing 82. The revamped model was a collaboration between designer Fulvio De Simoni, the Ferretti Group product strategy committee and the group’s engineering department. Key features include the yacht’s music hull. Developed with tech company Videoworks, the music hull includes a high definition speaker embedded into the hull to provide music for underwater dive and swimming sessions. This 27 metre yacht from designer Evan K Marshall will be attending Palm Beach after making the rounds at the Fort Lauderdale International Boat Show at the end of last year. With extensive glazing across three decks, the OA90R features a sociable layout with a dining area big enough to seat six guests. 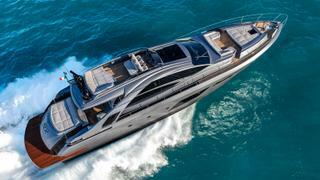 Accommodation is for a total of eight guests across a full beam master suite, VIP cabin and two twin cabins. 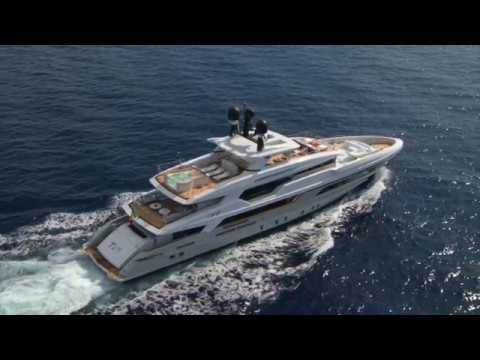 The design is capped off with an open-plan skylounge, with the superyacht wheelhouse blending seamlessly into the upper saloon and bar area.